In the hand are four bones, continuous with those of the fingers, called metacarpals (meta, beyond, carpus, wrist). They are covered by tendons on the back, and on the front by tendons, the muscles of the thumb and little finger, and skin pads. There is a very slight movement like opening a fan between these bones. They converge on the wrist bones and are morticed almost solidly to them. The hand moves with the wrist. 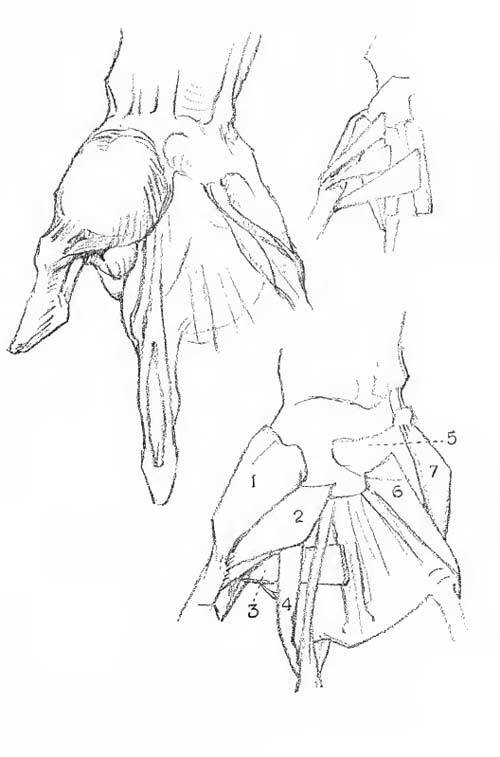 The dorsal tendons converge more sharply than the bones. joints. 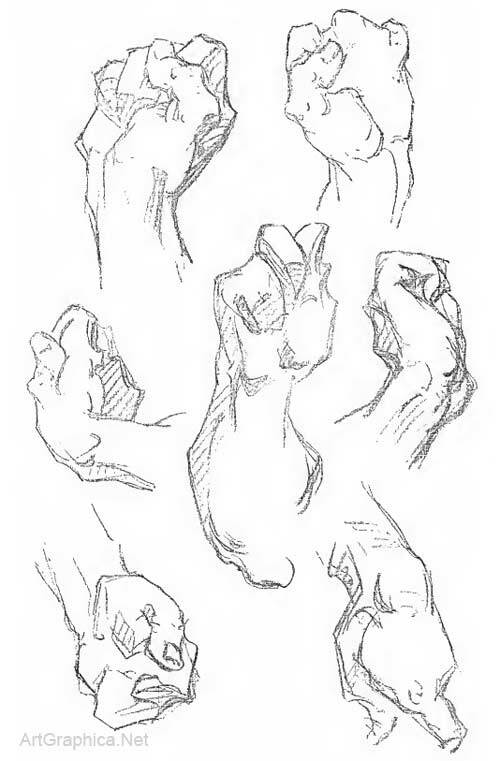 In the thumb and little fingers the muscles of this set are called abductors, and being in exposed positions, are larger. That of the first finger forms a prominent bulge between it and the thumb; that of the little finger forms a long fleshy mass reaching to the wrist. The masses of the hand are two -- one that of the hand proper, the other that of the thumb. 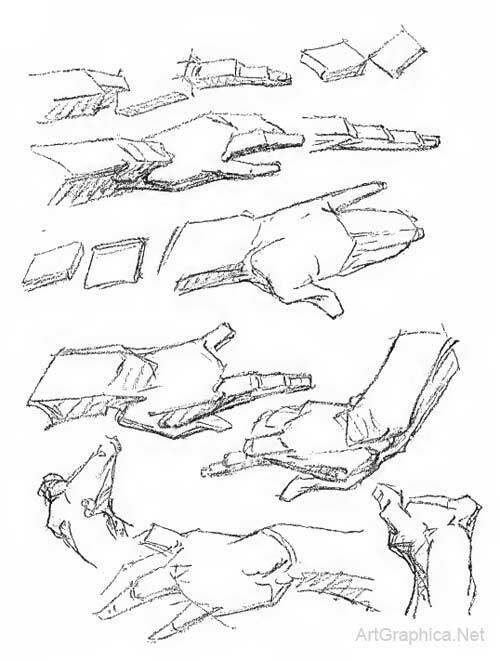 The first of these is beveled from knuckles to wrist on the edge; from wrist to knuckles on the flat side, and from first to little finger from side to side. It is slightly arched across the back. Somewhat more arched are the knuckles, concentric around the base of the thumb. 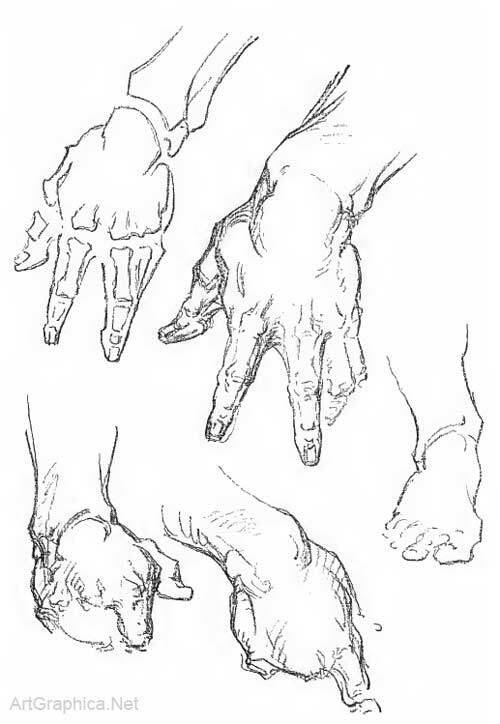 The second knuckle is larger and higher than the rest; the first is lower on its thumb side, where it has an overhang, as has also the knuckle of the little finger, due to their exposed positions. 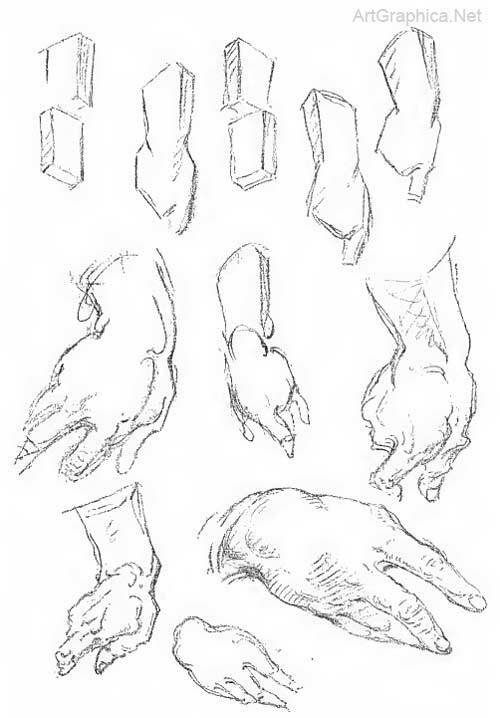 Belonging to the hand is the pyramidal mass of the first segment of the thumb, which joins on at an angle, never quite flat with the hand, and bending under it to more than a right angle with its flat surface. 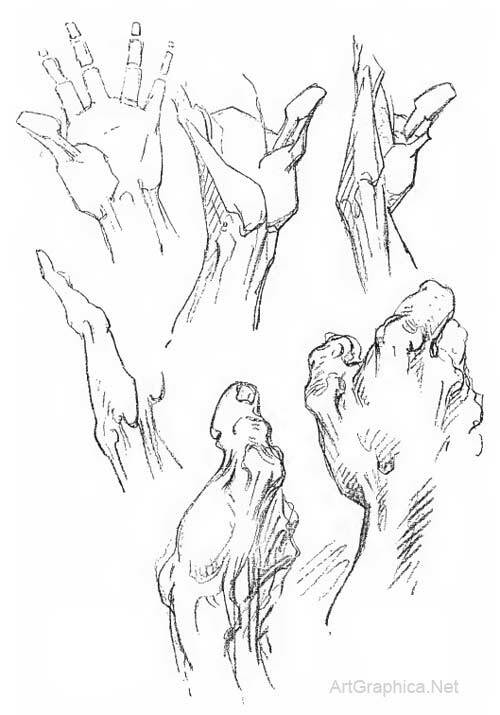 The thumb may be drawn in until only its root bulges beyond the lateral line of the hand, and may be carried out to a great angle with it. 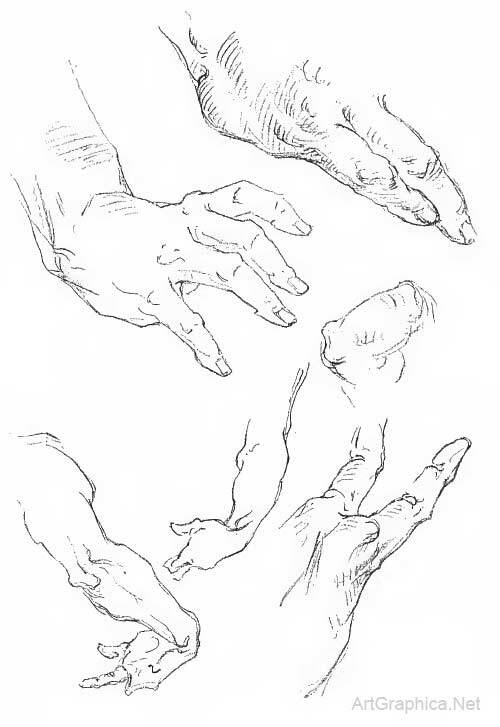 In this latter position its first segment forms a triangle whose base is the side of the hand, equal to it in length; whose height is, on the palmar surface, equal to the width of the hand, and on the dorsal surface, almost as great. On the little finger side, the form is given by the abductor muscle and the overhang of the knuckle, by which the curve of that side is carried well up to the middle of the first segment of the finger. The pad of the palm overlaps the wrist below and the knuckles above, reaching to the middle of the first segment of the fingers. superficial, and may be raised sharply under the skin. They represent two sets of tendons more or less blended, so are double and have connecting bands between them. Morticed with the bones of the hand are the bones of the wrist; the two make one mass, and the hand moves with the wrist. Eight bones (carpal bones) in two rows make the arch of the wrist; in size they are like deformed dice. The two pillars of this arch are seen on the oalmar side, prominent under the thumb and the little finger. The latter is the heel of the hand, but the arch is thicker and a bit higher on the thumb side. Under it pass the long flexor tendons to the fingers and thumb. The dome of the arch is seen on the back, with an apex at the trapezium under the first finger. 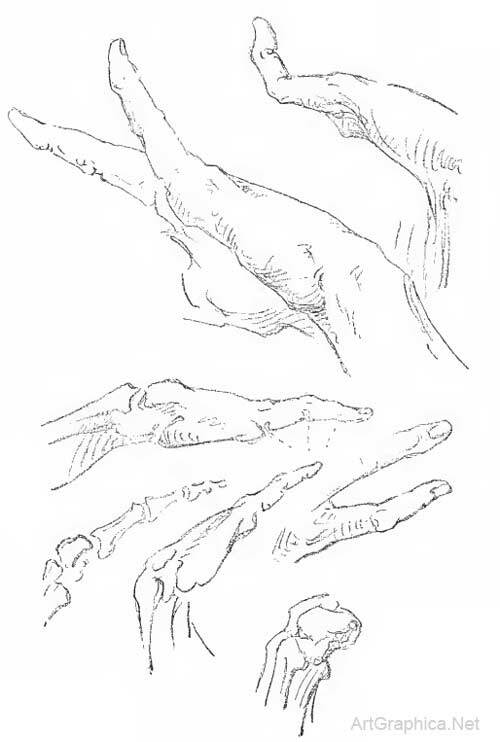 It is crossed by the long extensor tendons of the fingers, which converge on its outer half. Its width is twice its thickness. It Is narrower both ways where it joins the arm, giving an appearance of constriction. There is always a step-down from the back of the arm, over the wrist, to the hand. Being solid with the hand, the wrist moves with the hand on the forearm. Its movement is like that of a boat in water; easily tipping sideways (flexion and extension) with more difficulty tilting endways (side-bending) which in combination give some rotary movement, but having no twisting movement at all. This movement is accomplished by the forearm. The inset of this boat-shaped joint with the arm gives the appearance of constriction. The prow, under the thumb, is higher than the stern under the little finger. When fully extended, the back of the hand with the arm makes almost a right angle; when fully flexed, the palmar surface makes almost a right angle; the total movement therefore is slightly less than two right angles. When the wrist is fully flexed, it forms at the back a great curve over which the extensor tendons are drawn taut, so much so that the fingers can never be closed when the wrist is fully flexed. In this position the flexor tendons are raised prominently under the skin. 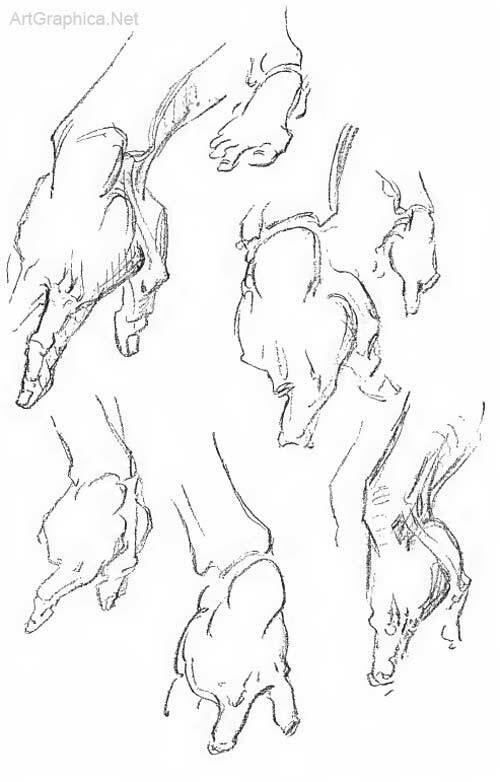 When hand and arm lie extended along a flat surface, it is the heel of the hand that is in contact, the arm bones being lifted from the surface. forearm. 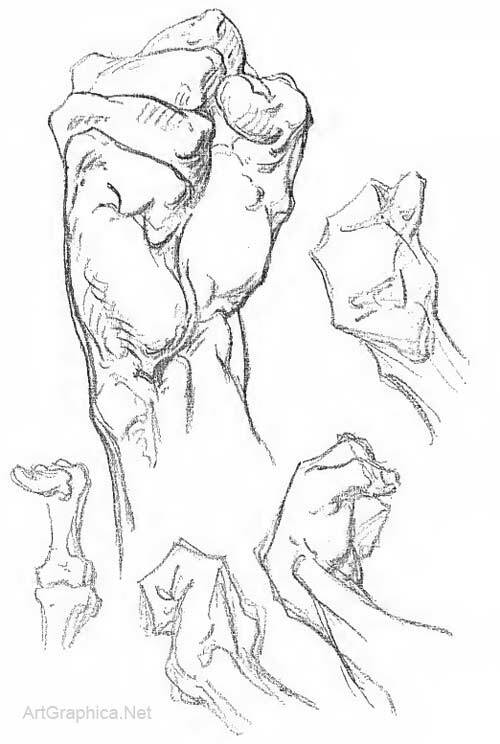 Only the tendons cross the wrist, the muscular bodies lying in the forearm. 6 Flexor brevis minimi digiti. 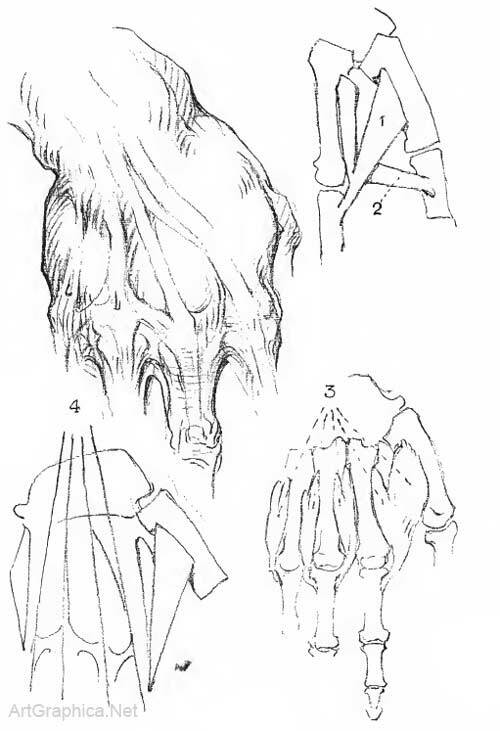 4 Tendons of extensor communis digitorum. In the hand as in the figure there is an Action and an inAction side. The side with the greatest angle is the Action side, the opposite is the inAction or straight side. With the hand turned down (prone) and drawn toward the body, the thumb side is the Action side, the little finger the inAction side. The inAction side is straight with the arm, while the thumb is almost at right angles with it. The inAction construction line runs straight down the arm to the base of the little finger. 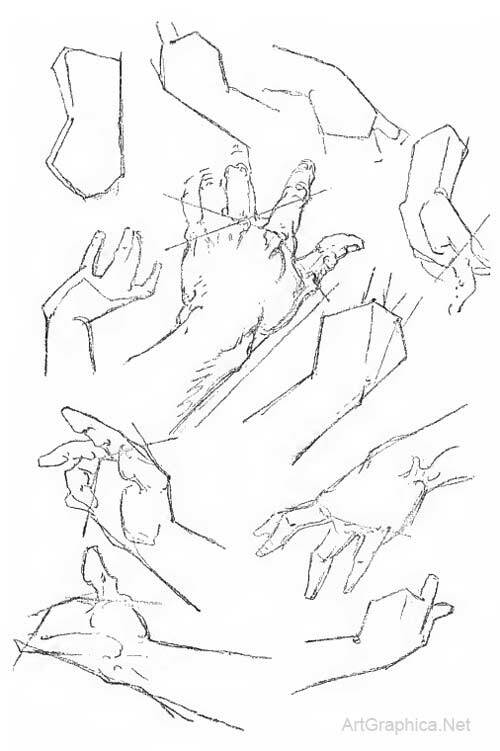 The Action construction line runs down the arm to the base of the thumb at the wrist, from there out to the middle joint, at the widest part of the hand; thence to the knuckle of the first finger, then to that ot the second finger, and then joins the inAction line at the little finger. 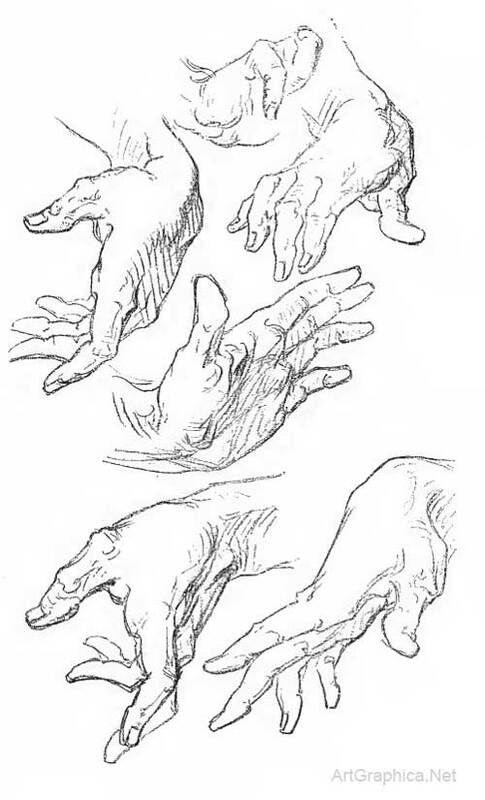 With the hand still prone, but drawn /row the body, the thumb side is the inAction side, and is straight with the arm, while the little finger is at almost right angles with it. The inAction construction line now runs straight to the middle joint of the thumb, while the Action line runs to the wrist on the little finger side, thence to the first joint, etc., etc. These construction lines, six in number, are the same with the palm turned up, according as it is drawn in or out. 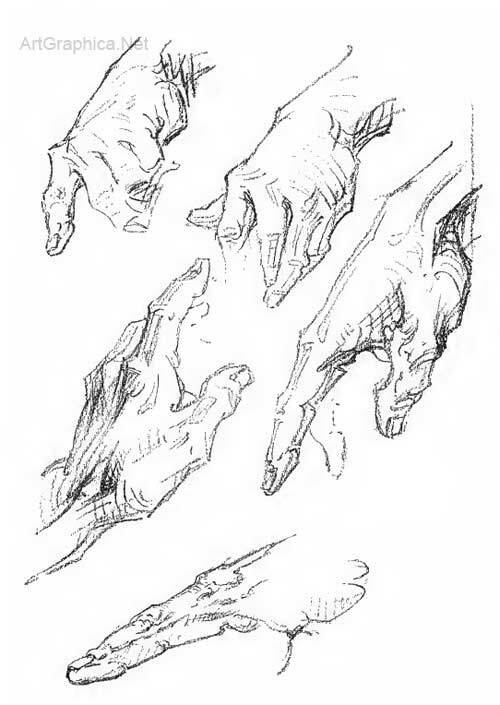 They place the fingers and indicate the Action and proportions of the hand.